This week for Sweet Melissa we baked a lemon ice box cake. It's unusual becasue it's baked for only a very short time, and then kept in the freezer until serving. 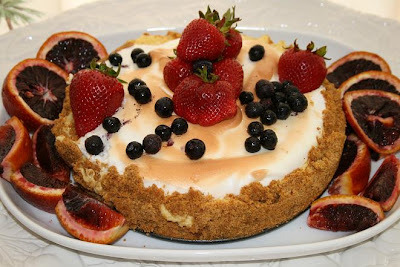 It is a layer of cooked lemon custard, topped with meringue. The meringue is browned in the oven during a short bake. 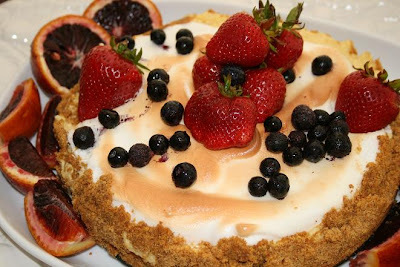 The recipe calls for the cake to be served with a strawberry sauce. Instead, I just topped the cake with some fresh fruit-strawberries, blueberries, and blood oranges. It turned out to be a nice refreshing cake for a hot Sunday afternoon. For the recipe, please see the cute blog "Keep Passing the Open Windows". At first, I thought those were figs in the background. Then I read the part about them being blood oranges! Ah, it's Monday all right! That looks very pretty! Somebody else was just blogging about Blood Oranges. I have never seen one until recently. How do they taste? I love the way you decorated the cake. It looks gorgeous. YUM! I love the fresh fruit on top. Great job! Megan- I love figs; I can't wait until they are in season! Thanks Wendy! Basically, I was too tired to make the sauce! Kristy- I really love blood oranges but they have a very short season. They are sweeter than regular oranges-well, at least I think so. You can usually buy blood orange juice at Trader Joes and other "healthy" markets. Barbara- Thank you so much! I really appreciate all your sweet comments! But, you are the master cook. I still can't believe you make your own lupinis! I like your fruit topping, nice touch. Nice looking cake. Oh so pretty! It looks like a work of art :) I had to skip this week but I can't wait to make this cake this summer. Thanks Sandy and Cheryl-you guys are great to make such nice comments! Thank you Fit Chick and Tracey!